Here you can allow your creativity to run free. For your designs with unlimited colors, color gradients or fine details, our printed Satinera labels and endless tapes are ideal. It is even possible to upload a photo. As high-quality care labels, gift ribbons for special occasions or decorative tapes for sewing – Satinera is elegant and lends your creations a sparkle. Our Satinera products are characterized by the best quality production and live up to the highest of demands. They are made from high-quality double-faced satin and are lightfast, wear-proof, washable up to 60°C and extremely durable. You can upload your own image, select a standard motif and enter text. Satinera fabric labels can be produced even from 1 item. With a width of 15mm they are particularly good for use as elegant, shiny labels for handmade products. Use our fonts and motifs or upload your own logo. The fabric labels are hot-sealed ensuring no fraying. Satinera individual labels with a width of 35mm are particularly suited for use as high-quality care labels for sewing into garments. Use our fonts and motifs or upload your finished design as a logo. Seal ends ensure clean processing of the fabric labels. 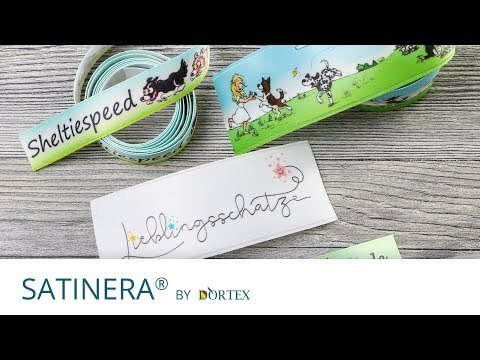 Endless versatility on a roll in Satinera quality: Design your own gift ribbon for very special occasions or create customized decorative tape for sewing onto your handmade products. Entered text or your uploaded logo will be repeated automatically without spaces. Can also be used as "Label on a roll"! When cutting by yourself, it is important to note: cut edges fray. Whether as a luxurious gift ribbon in an opulent width featuring your own design, or for use as care label from the roll: No spaces and no cutting marks to interrupt the flow of your design on tapes up to 100 meters in length. The length of your pattern repeat can be determined precisely to the millimeter. When cutting by yourself, it is important to note: cut edges fray.